The purpose of this document is to elaborate in detail, the business & management model as well as the implementation phases of this farm enterprise. Both the Business plan and Whole systems master plan are living documents and as such are continuously revised and updated as we learn and grow with the integrated farming operations here at Marrakesh Organics. This document is open sourced to benefit consultants, start up farms and sustainable farms managers. 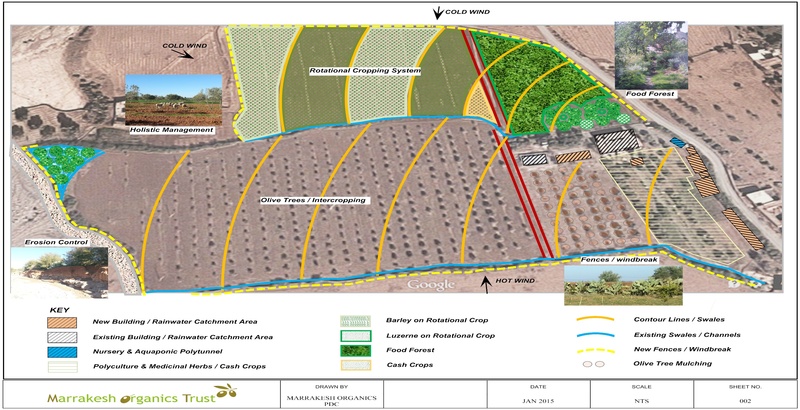 The Farm will serve as a model of Profitable Drylands Regenerative Agriculture, showcasing the different principals and techniques that reduce costs, improve quality and increase profit. We aspire to convince people that regenerative agriculture is not just environmentally viable but also economically profitable. The Farm is a Regenerative agriculture research site where important observations and successful experiments shall be documented and open sourced for the worldwide community.We also seek to develop a context addapted profitable business model that could be replicated elsewhere. The farm produces fresh, nutrient rich, beyond organic fruits and vegetables, animal products, as well as aromatic plants and medicinals. We intend to seek out new customers via occasional tours, tasting events and a good word of mouth reputation. We seek to develop mutual trust with our clients by providing the highest quality products, open communication, open doors, and by conducting our business in the most genuine and ethical ways. The Farm also serves as an occasional training center for local and international students via Permaculture Design Courses (PDC), Permaculture Internships, Natural building workshops and other sustainability and personal growth oriented workshops. The Farm shall adopt and develop a Holistic Management framework for its management and decision making processes. This will ensure clarity of purpose and prevent shortsighted decision-making and conflicts. Our farm entreprise is gradually trying to integrate a number of tools for its regenerative agriculture operations. Among which we find Permaculture Design, Keyline farming, Holistic management, Bio intensive gerdening, No till cover crop farming, Rotational grazing and Carbon farming. Permaculture is a Holistic design science that consciously integrates sustainable human settlements with regenerative ecosystems, mimicking the stability, autonomy and synergy inherent in natural systems. It is simply put, the wisdom of setting things in their right balance and place. Good design is one that recognizes then emulates the synergies and patterns of interaction which naturally exist between elements, therefore reducing input, time and labor. Working with rather than against Nature. Polycultures provide a stable and robust diversity as opposed to Monocultures. Agricultural practices that regenerate soils rather than degrade them. Water conservation through water harvesting, heavy mulching, composting, water recharge, anti evaporation strategies. All waste is recycled, outputs of each element in the system are used by other elements, and all inputs are provided by more that one element. Carbon Farming is simply farming in a way that reduces Greenhouse Gas emissions or captures and holds carbon in vegetation and soils. It is managing land, water, plants and animals to meet the Triple Challenge of Landscape Restoration, Climate Change and Food Security. It seeks to reduce emissions in its production processes, while increasing production and sequestering carbon in the landscape. This list is constantly growing. The benefits of Carbon Farming include Carbon Sequestration, reduced erosion and soil loss, improved soil structure, increased soil fertility, reduced soil salinity, healthier soils, vegetation and animals, increased biodiversity, buffering against drought and greater water efficiency. Need for additional facilities and hosting conveniences (Dorms, Tool shed, Nursery, Green house, Compost toilets, Showers, Hot water). Marrakesh Organics exists to transform a damaged arid landscape into a lush and abundant ecosystem that is ecologically sound and economically viable. This space shall serve as a peaceful sanctuary for family, friends & community and as a Permaculture demonstration and training site. Experiential: Trial & error, creativity, curiosity, problem solving, observation, interaction, natural wisdom, pattern literacy, growth, invention, reinvention, fluidity. Only once the start up capital is clarified and consensus is reached over budget priorities, a more realistic first year income can be projected, and suitable work breakdown and time stacking can be devised. More and more people are waking up to the dangers of conventional foods deficient in nutrients and full of chemicals, toxins and other detrimental agents; yet, organic alternatives are few on the Moroccan market and often too expensive and difficult to trust. We intend to fill in this demand by providing wholesome, organic foods at affordable prices. The farm is privileged to be only a half an hour drive from Marrakech. This will make delivery of farm products easier and cheaper. It will also provide the opportunity for people to visit often and pick up their baskets directly from the farm. More and more hotels are also catering to their customers’ request of organic products, making them a good niche for our products. The recent emergence of Organic health food stores also affirms this trend, making them a viable market. • Seasonal temperature. Highs, lows, averages etc. • Extreme events in regional history: floods, droughts etc. Research into and description of local and regional demography, psychography, character, history, markets and culture at large. Detailed and accurate topographic information is essential for WHS design and is obtained by outsourcing to local surveying contractors. This is a foundational element in the greater design process. Site soil testing is strongly suggested. Such tests offer invaluable information on the nature of the site, it’s future potential land uses in biological and engineering applications, and any necessary amendments due to deficiencies or toxicities. As an absolute fundamental to agriculture (and life) the size, location and nature of WHS on site is both extremely important to the project and also potentially risk laden. It is for this reason that while we design the broader water systems in-house we commonly outsource the engineering of dams and roads to specialist contractors. • Collection of observations of the relationship between site geology and hydrology. gravity feed to the greatest area. 1. Projected water needs based on intended forms of production/consumption. 2. Local precipitation models and projected future trends. • Calculate for and maximise roof/rain catchment for domestic use. Collection of a large set of observations of the property, looking at natural features. Establishment of key point in the landscape to define design for water movement through the Paddocks. Site soil testing and analysis around Swales & Dams to determine design and construction of swale systems. Design and application of Keyline design and deep ripping to the grazing paddocks to speed up pasture succession and soil carbon creation. Design & locate animal watering sites for trough tanks, plumbing locations. Access refers to the way or means of approach of traffic. This can be roads, tracks, lanes, paths, foot, stock, vehicle, wildlife etc. It also refers to relative proximity and ease of approach to towns, markets, neighbours etc. Also to wether or not services such as Utilities can be provided to a building site. In Regrarian farm design roads double as Water Harvesting Structures, mitigating the loss of water catchment otherwise experienced as pastures improve due to good land/animal management. Design and set out of all road and access according to the farm topography, drainage, dam placement etc. • Planting species to minimise maintenance and bank stabilisation. • Type of road construction based on quality and quantity of use. 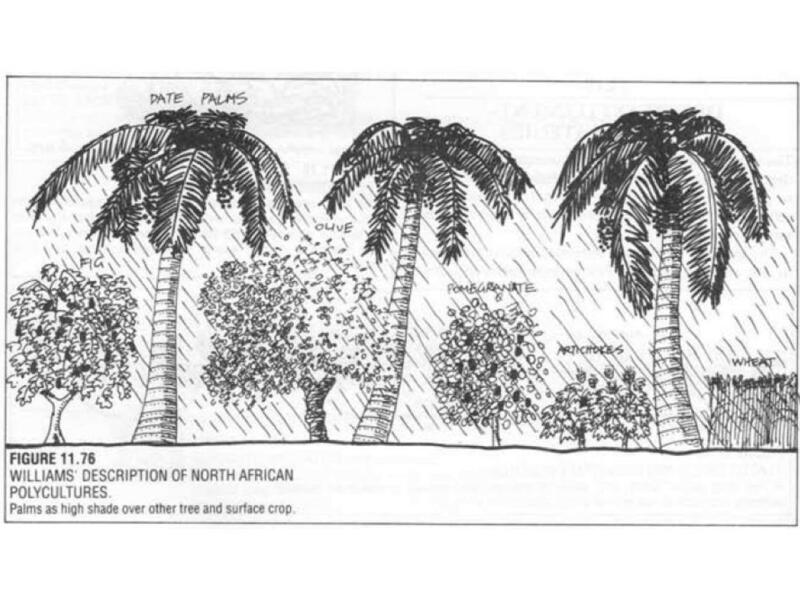 The typical North-African food forest oasis contains Palm trees as the high shade overstorey, then multiple fruit tree varieties such as Olives, figs and pomegranates, then a cover crop in between tree lines such as wheat, barley, corn and sorghum, to be alternated with legumes such as fava beans, peas and beans. This model works well and is resilient and productive, adding nitrogen fixing legume trees such as Leucaena and ground covers would accelerate and highly benefit the emergence and productivity of such a model. These models can be replicated throughout North Africa and the Middle East. 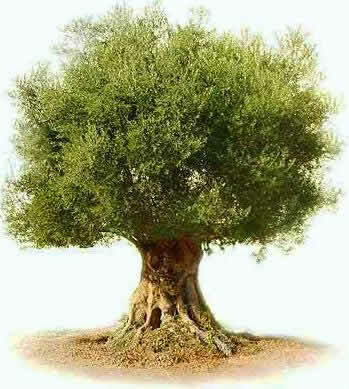 Guilds: Olive production being the main enterprise, special attention need be given to Olive trees, mainly thru a supportive guild of species that include legumes to compensate for nitrogen deficiency, lavender and Sage. Also, Inula Viscosa attracts a predator that feeds on Olive tree pests. 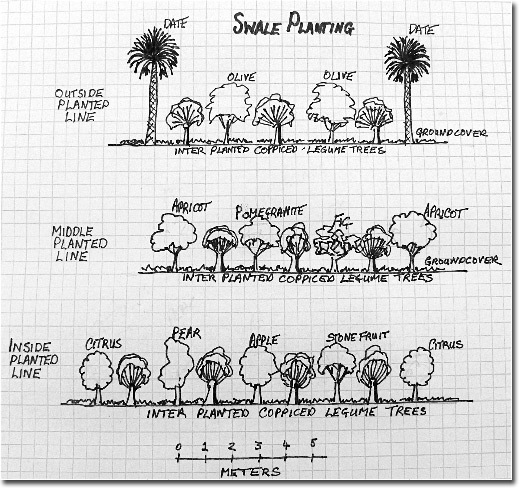 Design & specification of Arboricultural tree planting systems, Succession planting, Spacing. Water Conservation – Trees conserves soil moisture by reducing evaporation from the sun and wind. Erosion Control – Well designed systems incorporating diversity in planting species prevents the soil drying out and becoming less permeable to water penetration. Herbicide Elimination – With weed growth inhibited you can eliminate herbicide applications by cycling nutrients back into the ground through mulching. Windbreaks – Will greatly reduce heat waves and frost. Will also slow down water evaporation rate. Species Selection: Planning and research of the climate around the Ghmat area will determine the habit and vigor of local Species. Selection of large and fast growing for fuel wood or pole timber. Design and placement of tree systems in relation to soil type, nutrient flows and water availability. The design of tree systems with the integrated animal systems. Analysis of species planting that will increase wildlife, birds, which will be important in controlling pest and disease on the farm through the introduction of diversity. Types of Trees and plants to consider: Nitrogen fixing trees, Wind buffers, Aquatic and edge plants for Dams, fruit trees, Bee fodder trees species, forage hedgerow species and conservation and reforestation trees. In generations past fencing was a major undertaking involving countless, gruelling hours of work to install and then maintain. As a result paddock design was usually a matter of locating the shortest path between two convenient points. This approach saved time and money but failed to take other factors into account such as topography, hydrology, access etc. and even today farms experience many resulting inefficiencies. Nowadays we are blessed with increasingly affordable, lightweight effective electric fencing options for both permanent devisions(paddocks, forestry plots etc) and moveable in-paddock cells as are used in Holistic Management and Management Intensive Grazing. • Design fencing allowing for maximum function and flexibility while minimising cost. • Consideration of living fences as regenerative, low term option for paddock divisions. Soil Fertility and Soil Chemistry tests to determine lacking elements and to set a benchmark to test against in the future. Compost: Compost is a vital element for soil life and plant health providing the perfect habitat for high diversities of beneficial soil organisms, which work to break down organic matter and minerals, making them into plant available nutrients. Compost or Humus also acts as a sponge to hold moisture longer and has a great water infiltration rate, which prevents run off during heavy rains. Animal nutrition management, feeding & health: Forage/fodder selection, feeding evaluation, feeding cost analysis and recommendation. Thank you for sharing the plan with details. I am also interested to use permaculture in a family scale property. I was wondering: are the plants which you are planning to use available in Morocco? Are they common in Morocco?